The figures in this document represent a sample cube. You should match as many colors on your cube as possible to the figures, then make mental notes about which colors correspond between your cube and the figures. 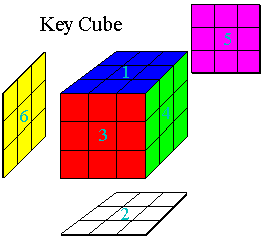 In addition, the middle-center pieces are numbered for reference such that 1 and 2 are opposite each other and 3, 4, 5, and 6 go around the cube in a circle. Finally, the diagrams show all six sides of the cube by pretending that mirrors are being held up so that you may see the "hidden" sides. The directions for what parts of the cube to turn and when are given in a code that is relative to the current positioning of the cube. Each side or slice descriptor refers to a side with respect to the figure the move is referenced to. This means that the front side can be a different color, depending on the diagram being used. The code is easy to follow and instructive diagrams are included for each of the moves. V for the vertical slice (between the left and right sides). Although the directions are relative to the current positioning of the cube, the numbers assigned to each side always stay with the same color/side they were originally assigned. There are no symbols listed for the bottom, right, and back because these directions do not require them. The numbers tell you which direction to rotate a given side or slice and how many times to rotate it: 1 for one quarter turn clockwise, -1 for one quarter turn counterclockwise, and 2 for two quarter turns (half way around). For example, U F2 L-1 means to rotate the upper side clockwise one quarter turn, the front side clockwise twice (half way around), and the left side counterclockwise one quarter turn. Look directly at the specified side indicated to determine which direction is clockwise or counterclockwise. For the vertical slice, V, look at the cube through the right side to determine the clockwise direction. For the horizontal slice, H, look at the cube through the top side to determine the clockwise direction. In the figures, any gray pieces represent pieces that don't matter and can be any color. To increase clarity, the figures do, at times, have extra colored pieces to represent an example of the situation being described; keep this in mind when comparing the cubes shown to your cube. Wherever there are numbers on the pieces in the figures, those colors must match yours exactly. 6. and 7. Correctly position and orient the four remaining middle edge pieces. Optional: Rotate the middle-center piece to fix pictures or logos. The use of platinum as a pinnacle precious metal is very much the replica watches of this collection. Usually I have a clear vision on what I think about a watch and its brand, but here I have more mixed feelings of concern and rolex replica sale than anything else. So, humor me a bit as I try and frame it. Specs about the watch, I get to at the end. A blued hand for the pointer rolex submariner replica date further assists legibility and reduces dial clutter, keeping the overall design simple and elegant. The main replica watches sale for this might be that the machines used to produce hands and indices are set up for gold and replica watches platinum such small pieces would be incredibly difficult to craft from platinum, possibly the most challenging metals to work with in the luxury replica watches uk industry.